I know many of you that have read about Longshot's story have been waiting anxiously to learn what the geolocator that he wore for nine months could tell us about his migration. Believe us...we have been waiting anxiously too! The delay has mostly had to do with the mechanics of the geolocator itself (if you aren't sure what a geolocator is, read about it here). The device is designed to be read using computer software, but because of some technical issues it had to be mailed back to the U.K. so that the manufacturer could disassemble it. Longshot, the Prothonotary Warbler that carried a "backpack" geolocator with him from July 2014 to April 2015, photographed at Beidler Forest earlier this year. Photo courtesy of Joan Eckhardt. Technicalities aside, I am happy to announce that we have now translated the light-levels readings from the device into latitude-longitude data points, and have successfully learned the fall migration pathway and wintering location for Longshot. The map below shows, to our best knowledge, his fall migration south, leaving from Beidler Forest in late August. His trip first took him to the panhandle of Florida and from there across the Gulf of Mexico to Cuba. 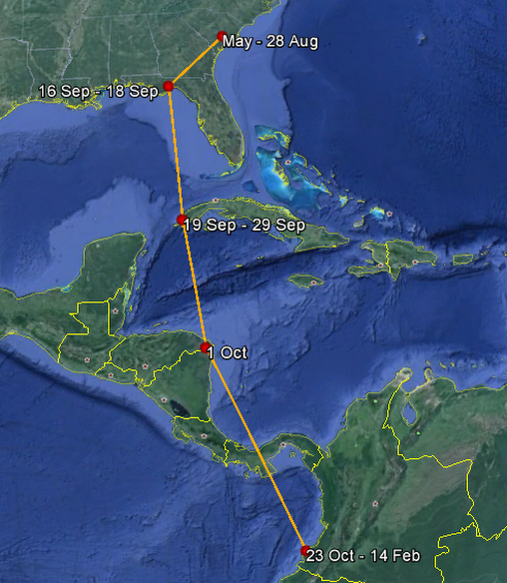 He then continued south towards Central America, landing around the Nicaraguan/Honduran border on October 1st. From here, he traveled another 1,000 miles south to the Colombian coast, perhaps stopping in Panama along the way. His route took him between 2,000 and 2,500 miles one-way, and the overall trip took almost two months. A Google Earth map of Longshot's migration route and wintering location. His geolocator died in February 2015, so we won't know his northern migration back to Beidler from Colombia. Map courtesy of Erik Johnson. 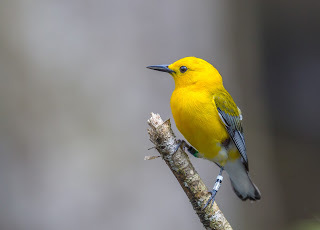 This is, to our knowledge, the first time in South Carolina history that the migration route and wintering location of a Prothonotary Warbler breeding in the state has ever been documented! The battery in the geolocator died on February 14th, 2015, and because of this, we unfortunately cannot determine Longshot's northern migration back to Beidler Forest. What we do know, however, is that his northern return at least covered 2,000 miles, AND that he returned to within a few feet of his breeding territory in 2014. Given that this bird weighs half an ounce (imagine the weight of two quarters), migrates at night, and was coming from another continent, this is an astonishing feat. We've been lucky to receive some publicity on Longshot's journey. The National Audubon Society's website team has written a fascinating story on Prothonotary Warblers, including work done in Louisiana and South Carolina. Our local Post & Courier newspaper published both a print and online article that covers Longshot's story in detail. In addition, Mac Stone (former Seasonal Naturalist at Beidler Forest and current executive director of the Naturaland Trust in upstate South Carolina) wrote a featured article for Birdwatching Magazine on Longshot, and Mac was actually present the day he was recaptured to take some amazing photographs (Mac's website). We hope that this publicity brings to light the challenges that so many migratory birds face. The conservation of birds like the Prothonotary Warbler is not tied to one state, country, or organization. These birds depend on multiple habitats that often cross hemispheres, and therefore working collectively on the breeding, migratory, and wintering grounds is the only way that we can successfully help these birds. Want to do your part? Support organizations that work to conserve habitat for birds in North, Central, and South America. Work within your community to make sure that it is bird-friendly. Most importantly - get involved! You can do this by volunteering at a center, participating in a bird count, or joining your local Audubon chapter. We need you! Author's Note: If it were for the help and knowledge of Norman Brunswig (retired director of Audubon SC) and Julie Hovis (biologist at Shaw Air Force Base who actually put the geolocator on Longshot), this project would never had happened. They deserve to be recognized for their tremendous contribution to this project! Thanks also to all of the volunteers who gave their time to help collect data, take pictures, and assist with the banding project.